First Tunisia and now Egypt - the protests, which began as food riots, have spread across North Africa and into the Middle East such as Yemen. At first glance, China must be watching the unrest with some trepidation. After all, Africa is a huge source of natural resource (though not North Africa), but any disruption to Suez Canal traffic could be a concern as it would interrupt the supply chain. At a different level, the Chinese leadership may be thinking: "This is what happens when economic growth slows." In the intermediate term, China faces a number of challenges. Firstly, it is said that China needs GDP growth of roughly 8% to accommodate the millions of migrants from the villages and therefore growth needs to continue. However, the current strategy of focusing on export-driven growth is untenable in the long-term - it is causing trade tensions, an overvalued currency and the importation of inflation from the Fed's QE2 policy. China's leadership recognizes these issues. I pointed out before that the latest five year plan calls for more balanced growth - a shift away from investment to domestic consumption. Part of this strategy has been to upgrade the Chinese workforce through education, but unemployment among the educated is rising and creating social tension. Already the discontent is showing itself. Consider this viral video about the oppressed rabbits rising against the tigers. How things have changed! Not so long ago, e.g. the Cultural Revolution, any hint of less than full support for the leadership would have been viewed as a direct challenge to the government and dealt with in the harshest possible fashion. What's more, some have suggested that Vietnam, which is on China's southern border, is next. This brings us back to the Tunisian and Egyptian protests. Consider this CNN story entitled Young, educated and underemployed: the face of the Arab world's protesters. Don't forget that the spark for the Tunisian riots was the incident where a young university graduate forced to sell vegetables on the streets set himself on fire in protest. The unrest in Tunisia has toppled the government there and the Egyptian ones are threatening to topple another. Given the level of discontent from economic pressures, is this a lesson for China? Are the revolutions of 1848 which swept Europe repeating itself in 2011? Could China's leadership be re-thinking about the tradeoffs between the risks of an asset bubble compared to the imperative of continued growth? If they tilt towards the latter, does that mean that the property bubble continues? We know that when bubbles blow up, they end very badly. Note that a recent poll indicates that 45% of investors will face a financial crisis in the next five years. For investors, these developments mean greater market volatility. Which is more elitist? France or America? 1. The French elite work very hard and are educated very well. 2. Contrary to stereotype, France has arguably the strongest work ethic in the world. Given the rates of taxation, and the difficulty of being fired, most people still do a fair amount of work and they do it fairly well. If that's not a work ethic, what is? 3. Esteem and approbation are especially important in France, as incentives. This is one reason, not always voiced as such, why immigration in such an issue there. It breaks down prevailing forms of status competition. 4. France has been well-positioned to benefit from the growth and economic integration of Europe. The more open the economy, the less domestic economic policy matters. 5. The French are very smart and able, and have been so for a long time. You'll note that a wide variety of French companies, whether Dannon or Carrefour, do well around the world. The French are preeminent globalizers. 6. The foreigners' view of France, and its charm, would be very different if all of the country's buildings dated from after World War II. 7. The French are the very best, and wisest, consumers in the entire world, whether it be for clothing, music, food, or for that matter Hollywood movies and American blues and jazz. The French government tries to influence this activity, or put up some nominal protectionist measures, but for the most part this French specialty and strength remains unregulated. It helps account for the very high living standard there. 8. If you see a "World Music" recording from a French record label, buy it. Personally, what I find most distressing about France is the limited number of dimensions for status competition. Very often there is one right way to do things, to dress, and so on. But that's also part of what makes the place work. France is at the heart of "Old Europe", where the vestiges of a class system still prevails. That got me thinking: Is France more elitist than America? The chart below from the OECD that plots the Gini coefficient, which is a measure of income inequality (the higher the less equal), against inter-generational social mobility shows that the Gini coefficient is slightly higher in the US than France but the French have a substantially better social mobility. What about the French system of grande écoles? Doesn't that serve to keep French society elitist? On the other hand, I have seen many Wall Street recruiters look only for graduates from a "top school", i.e. if you didn't graduate from one of the best schools, don't bother me? When I was a kid, the people on this list were the kinds of professions that you aspired to - and to which they still no doubt aspire to in France. In America, the Wall Street financiers and hedge fund managers now top the list of the elite. The ﬁnancial industry, with its incestuous relationships with government agencies, runs a close second to the energy industry. In the last 10 years or so, their machine, led by the famously failed economic consultant Alan Greenspan – one of the few businessmen ever to be laughed out of business – seemed perhaps the most effective. It lacks, though, the multi-decadal attitude-changing propaganda of the oil industry. Still, in ﬁnance they had the “regulators,” deregulating up a storm, to the enormous proﬁt of their industry. Even with the biggest-ever ﬁnancial ﬁasco, entirely brought on by the collective incompetence they produced (“they” being the ﬁ nancial regulators and the ﬁnancial industry leaders working together in some strange, would-be symbiotic relationship), reform is still difﬁ cult. Even with everyone hating them, the ﬁ nancial industry comes out smelling like a rose with less competition, proﬁ ts higher than ever, and not just too big to fail, but bigger still. If America were to go back to "simpler times", where kids looked up to neurosurgeons, four-star generals and cancer researchers, does that mean it becomes more French? "Negative divergence," Cried the technicians! The standard explanation for this concern is that the "generals", large caps, are leading the market, while the small cap troops aren't following. I think it's time to take a deep breath and look at the intermediate term trend in context. Consider the chart of the small cap Russell 2000 to the market, which is shown below. No matter how you slice it, the trend of small cap outperformance remains intact and panic isn't warranted. 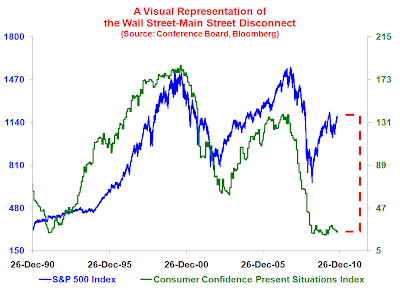 The relative chart of the Consumer Discretionary stocks compared to the Consumer Staple stocks, shown below, is a good measure of risk aversion. While the short term uptrend in the "buy risk" has been broken, signaling that either a sideways consolidation or short-term correction, the intermediate trend remains intact. Another way of thinking about about the risk aversion trade is to analyze the performance of the Morgan Stanley Cyclical Index (CYC) relative to the market. By this metric, the pro-cyclical trade remains in an uptrend. I see that the latest sentiment figures shows the crowd is pulling back a touch from their extreme levels of bullishness. If investors are this skittish and they are ready to turn tail at the first sign of minor market weakness, then this sense of nervousness would indeed be good news for the bulls. Given the strong tailwinds from the presidential cycle and the strength of the underlying uptrends, I would be inclined to give the bulls the benefit of the doubt for now, at least on an intermediate term basis. Do you believe in the Bernanke Put? 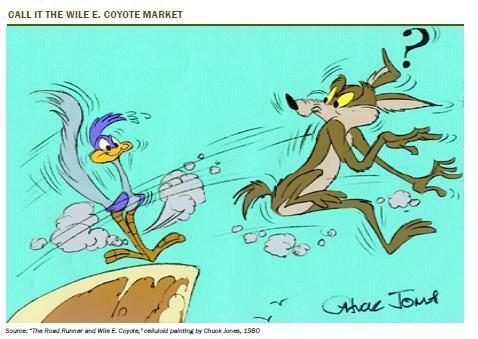 Last week, Rosenberg called the current state of the financial market a Wile E. Coyote market, or a market that seemingly ignores the major macro-economic risks that could blow up the global economy. We have an incredible bear market rally on our hands. History shows that these spasms can go further than anyone thinks. But after the U.S. market staged a monstrous 80-per-cent-plus rally from its March, 2009, lows (the most pronounced bounce in such a short time since 1955), it has become seriously overextended. Meanwhile, practically every pundit is extrapolating the recent trend into the future because that is the easy thing to do. Most investors see only the recent returns; they do not see the nearly invisible risks. But the risks are there. I recall all too well the 2003-07 bear market rally – yes, that is what it was. It was no long-term bull run such as 1949-1966 or 1982-2000. It was a classic bear market rally, and it ended in tears because what drove the market upward was phony wealth generated by a non-productive asset called housing alongside widespread financial engineering, which triggered a wave of artificial paper profits. Food inflation in the emerging market economies, especially in China, which could lead to the Chinese authorities taking steps to cool down its overheated economy – leading to a global recession. When will it be time for QE3? While I would tend to agree with many of Rosenberg’s concerns about the macro-economic risks to this upturn, most of the risks in his outline are economic in nature and could be addressed by central bank action. In such a case, the question for investors has to be: Were any of these negative outcomes were to occur, would the Bernanke Fed respond with another round of quantitative easing? In other words, is there a Bernanke Put in the market? I believe that the future trajectory of the global economy and asset prices are highly policy dependent. While I have my opinion, I am not confident enough in them to be a basis for investment decisions. That’s why I depend on the discipline of the Inflation-Deflation Timer Model, as the underlying philosophy is to allow market prices to tell us the likely direction of policy and price trends, which in turn, allows us to be more tactical and able to capitalize on the intermediate swings in the markets. Given all the hoopla over Hu Jintao's visit to the United States, I thought that it would be useful to think about what happens after Hu leaves the stage. Who takes the mantle of leadership and what are his views? Vice-President Xi Jinping’s brief visit to the western-China metropolis of Chongqing earlier this month has given important clues about the “crown prince’s” political orientations and his relations with key Chinese Communist Party (CCP) factions. After his induction into the Central Military Commission (CMC) last October, there is little doubt that the 57-year-old Politburo Standing Committee (PBSC) member will succeed Hu Jintao as Party General Secretary at the 18th Party Congress slated for late 2012. During his "Chongqing tour," however, Xi dropped strong hints about his deeply-held ideology and aspirations. Equally significantly, Xi’s bonding with Politburo member and Chongqing Party Secretary Bo Xilai shows that the vice-president may be putting together his own team in the run-up to taking over the helm in less than two years’ time. Seeds of conflict between Hu and Xi, respectively the “core” of the CCP’s Fourth- and Fifth-Generation leadership, might also have been sown. Since Bo became party chief of China’s most populous city in late 2007, the flamboyant former minister of commerce has made headlines with his no-holds-barred advocacy of Maoist norms. In his speeches, the charismatic Bo has profusely cited Mao-era slogans such as “plain living and hard struggle” and “human beings need to have [a revolutionary] spirit” (People’s Daily, June 7; Chongqing Evening News, June 28). He has resuscitated Cultural Revolution-vintage revolutionary operas. Bo, who is the 61-year-old son of conservative party elder Bo Yibo, even asks his secretaries to regularly text-message Mao quotations to the city’s students (See “The CCP's Disturbing Revival of Maoism,” China Brief, November 19, 2009). On the economic front, the high-profile “princeling” has made waves with his attempts to go after “red GDP,” a reference to economic construction that exemplifies Maoist egalitarianism. Chongqing has emerged as a national pacesetter in social-welfare policies such as providing subsidized public housing to the city’s masses (Chongqing Evening News, May 1; China News Service, April 20). In other words, the next Party General Secretary is closely tied to someone who leans Maoist. If Xi Jinping does embrace some form of Maoism, what happens to China then? Will Deng Xiaopeng's comment about "glorious to be rich" be no longer applicable? The change in Chinese leadership doesn't seem to be on the market's radar screen at the moment, but as we approach the end of 2012 it will be. As I outlined in my 2011 forecast, concerns like these are a 2H 2011 story, possibly even 1H 2012. For now, the Fed wants to have a party so let's party on (but keep an eye on the exit). In the US, headline CPI came in at 0.5%, ahead of consensus 0.4%, but core CPI remained tame at 0.1%, in line with expectations. In Europe, eurozone inflation hit a 26 month high and ECB president Jean-Claude Trichet warned of a crackdown on inflation before the summer (though it's a mystery to me how they plan to do that in the face of a fragile banking system and rising sovereign risk). China just raised reserve requirements by 0.5% to try to cool off an overheating economy. In particular, rising food prices have pressured emerging market economies. In Tunisia, what began as food riots morphed into popular riots eventually brought down the government, which raised concerns about which country might be next. Meanwhile in India, the cabinet met last week to address the problem of surging food prices, as the prices of basic staples like onions have skyrocketed (also see analysis here). As a result, emerging market equities have began to weaken, but a look at EEM, the emerging markets ETF, shows that its technical uptrend remains intact. We may be at a setup for emerging market stocks compared to commmodity prices here. After all, emerging market stocks and commodities are the same side of the coin of the macro "risk" trade, the same side of the coin of the macro "reflation" trade and the macro "growth" trade. Consider this chart below of EEM compared to the CRB Index. Emerging market stocks appear to be near the bottom of a trading range compared to commodities. How to play this? After all, it's difficult to get exposure to the R/J CRB Index. One way is to buy EEM and short XLE, the Energy sector ETF, as a pair trade. If emerging market stocks and commodities are still the same side of the coin of the risk/reflation/growth trade, then either EEM has weakened too much or commodity prices and commodity stocks are ahead of themselves. There is, of course, the possibility that the relationship is breaking down - which is a good idea for anyone who enters such a trade to put on a fairly tight stop in order to define their own risk-reward comfort zone. Amy Chua's article Why Chinese Mothers are Superior has ignited a firestorm in the press and blogosphere. As someone who is of Chinese heritage and moved to Canada from Hong Kong at the age of ten, I feel that I am in a special position to comment on the article. Kids, when pushed hard, will tend to excel (on average). This model of child rearing has been used since the days of Sparta. Hard effort, perseverance, duty, honor...and family - these are all attributes of the "Chinese" mother model advocated by Amy Chua. By contrast, the Athenian model of a greater focus on culture does create different results. Its citizens are more creative and "cultured", but there are tradeoffs. Overall, I do believe that Americans (and Canadians) focus on self-esteem and self-actualization too much. For instance, Paul Kedrosky pointed to the documentary Two Million Minutes as why Americans are falling behind India and China. I would add to my comments that parenting is about making choices for how you want to mold your child. During the 1980's, when Japan was ascendant, many analysts pointed to the rote learning and the discipline of the Japanese education system (which is similar in approach to the Chinese, Korean, etc.) What happened next? For the record, I am the parent of a ten-year-old. She does have sleepovers and play dates. On the other hand, she plays the cello and the oboe, both of which aren't easy instruments. We optimize her activities to her strengths. She is a singer. She dance and acts, with the objective of the "triple threat" for musical theatre. My approach is to encourage her to maximize her skill set while acquiring the right tools for her adult life, e.g. study skills. Performing arts isn't about making her a world famous child actor, but more about learning presentation and social skills - sort of a modern day finishing school. Hopefully for my bank account, she won't be good enough for Juillard. It is a truism in investment management that often in our investment careers, our investment styles will be out of favor. I therefore winced when end of year client letters started filtering out and it was evident that the Value style was out of favor. Through mid-September of 2010, the stock market was essentially a roller-coaster with no net gains for the year, but the final months saw a speculative burst that was heavily skewed toward cyclicals, small-caps, commodities, and shares characterized by low stability of earnings and high sensitivity to market risk. The Strategic Growth Fund finished the year with a slight loss of 3.62%. The loss resulted from our defense against an overvalued, overbought, overbullish, rising-yields condition coupled with a runup in risk assets that was still uncorrected as the year came to a close. While the decline was minor from a long-term perspective, it felt excruciating in the final weeks of 2010, as stocks characterized by low-quality, low yield and high risk persistently outperformed those ranked higher in quality, yield and stability. Since I have a Value bias in my own genetic makeup, I had to wince when I read the above paragraph. Moreover, since Jeremy Grantham and his firm GMO has gone on record as favoring high quality US stocks, the same effect would have hurt their performance as well. Some investors have asked me what to do about their managers during periods of underperformance. My preferred method of manager evaluation has to do with how the manager communicates during these painful periods. Our investment objective remains to outperform our benchmarks over complete market cycles (peak-to-peak, trough-to-trough, bull market plus bear market), with smaller periodic losses than a buy-and-hold strategy. In the Strategic Growth Fund, we've achieved that since inception, and over the complete market cycles we've observed since then - from the 2000 peak to the 2007 peak, from the 2002 trough to the 2009 trough, and from the 2007 peak to the recent highs. The challenge will be the cycle from the 2009 low to the next bear market low, whenever it arrives, but we'll rise to that challenge day to day. To that end, we've introduced some new methods that broaden the range of Market Climates we define, and will allow us to accept moderate (possibly transitory) exposures to market fluctuations more frequently. The main focus of this research been on robust methods to integrate the information from multiple data sets and multiple time frames. We've extensively tested this approach to uncertainty, and expect that it will contribute to future performance. The basic approach falls into the class of what are called "ensemble methods." Our investment positions continue to be driven by our most reliable measures of valuation, market action, sentiment, yield pressures and other variables, but rather than applying a single model over the full span of history, we can proliferate multiple models and evaluate them over numerous samples of history. In that way, we can measure not only risk (the spread between individual returns and the average outcome), but also uncertainty (the possibility that any particular model or view about the world is incorrect). Suppose we look at present market conditions. The more uniform the conclusions are about expected returns, regardless of how we slice the data, the more confidence we can have about investment exposure. In contrast, the wider the dispersion of conclusions about expected returns, the greater uncertainty there is, and the smaller the proportional exposure. In an environment where we remain skeptical that the underlying economic difficulties have vanished, I believe that this is our best response. I am right and the market is wrong! A greater concern is a manager who starts to write "I am right and the market is wrong" comments. Consider this account of how David Rosenberg "lost his cool" by picking through the data to show how his double-dip call was on the mark by telling his critics to "put that in your pipe and smoke it." Were it anyone except for the statuture of someone like Rosenberg, I would be really concerned. These kinds of outbursts are either signs of cognitive dissonance, or a sign of capitulation for that investing style. Take your pick. I have written before that for buy-and-hold investors who want to adopt a portfolio style in this current volatile and low return environment, a focus on either high quality stocks or Rosenberg's SIRP (Safety and Income at a Reasonable Price) are sensible approaches. However, they will have to suffer through periods of underperformance as well as bear markets. This is just one of those times. It's a Class War, Stupid! There have been a lot of instant analysis of the Tucson shooting that occurred over the weekend. Some have characterized the gunman as a "whack job" and pointed out his ramblings, others have viewed it through a political lens and blamed the hate mongers and their enablers on the Right. I believe that the causes are more fundamental: It's the Class War. 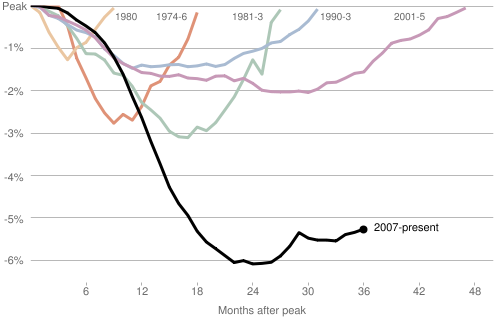 The chart below from Economix shows the pace of job recovery in the United States of this cycle compared to past cycles. Analysts have described this recovery as tepid, but "tepid" doesn't even begin to fully characterize this upturn. I have also written before about the risks in the rising gap between rich and poor. 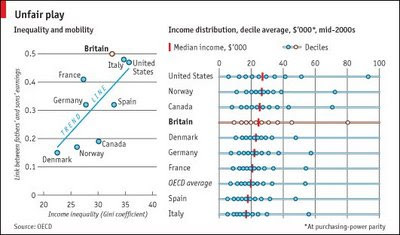 The chart below from the OECD relates the Gini coefficient, as a measure of income disparity, to social mobility. The US has a high level of income disparity but also a low level of social mobility, indicating that the "American Dream" is just that - a dream. Now the chickens are coming home to roost. 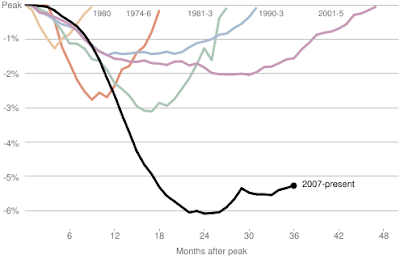 Consider this chart of the uneven recovery. Wall Street (the elite) wins and Main Street (everyone else) loses. As the "recovery" continues and the vast majority of the population doesn't get its share, is it any wonder that people are getting cranky? We may blame this specific shooting on the crazies on the Right, along with the Libertarians and the Tea Partiers. As the fruits of this recovery gets more and more uneven and we have to deal with the fallout (examples here and here), don't be surprised if there is a reaction from the Left in the not too distant future. We used to call that "going Postal". I call this the first shot in a Class War. The Fed wants to party. The dose of liquidity effected by the Fed is inducing speculative activity into risky assets. The Inflation-Deflation Timer Model uses commodity prices as the canaries in the mine and those canaries are chirping quite happily. These readings indicate the "inflation" or high beta trade of commodities, commodity producers and emerging market equities. A tour around the world of global equities confirm the uptrend. Virtually all developed markets are either in constructive uptrends or have broken out to new recovery highs. Overly bullish investor sentiment points to correction. I continue to be concerned about excessive bullishness in investor surveys, as well as option sentiment readings. Given the strong momentum exhibited by global markets, this suggests that any weakness should be viewed as corrections and opportunities to deploy new cash rather than an intermediate term top. Be cautious about macro risks. Numerous macro risks are evident: US municipal defaults loom. European sovereign risks could sink the banking system. China could miscalculate and tighten itself into a hard landing. For the time being, however, any problem is more likely to manifest itself in the 2H. Given the powerful momentum shown in the markets, I suggests that traders stay long risky assets but maintain an appropriate risk control discipline in order to allow winners to run and limit downside losses. For a full summary of my macro views, see this. Time for gold bulls to panic? Gold prices have been showing weakness in the past couple of sessions. With gold prices down , despite what should be positive news for the reflation trade, and analysis from the likes of Bespoke showing that this kind of price action may be the start of a prolonged period of weakness, is it time for gold bulls to panic? It's time to take a deep breath and watch what the rest of the commodity complex is doing. After all, commodity prices are the canaries in the inflation-deflation mine. The chart below shows the ratio of gold to the Reuters/Jeffries CRB Index of commodities. On a relative basis, gold has retreated but remain solidly in the middle of the trading range with other commodities. How are commodity prices behaving? Looking at the chart below - just fine, thank you very much. In fact, the point and figure chart of the CRB below shows that commodity prices have outrun their uptrend line! When does the Fed take away the punch bowl? It is said that the role of a central banker is to take away the punch bowl just as the party is getting going. Now that we have a tepid recovery in the US and there are signs of stabilization in Europe, what happens after the expiry of QE2? "The crisis that required zero interest rates has passed," said Mr Einhorn, who co-founded and runs Greenlight Capital, a $6.5bn (£4.2bn) fund. By not raising rates "it increases the chance that governments will over-borrow and fall into a debt trap". The criticism of the Federal Reserve comes as it embarks on another $600bn (£380bn) of quantitative easing – or printing money – in an effort to fire up a stronger recovery next year. 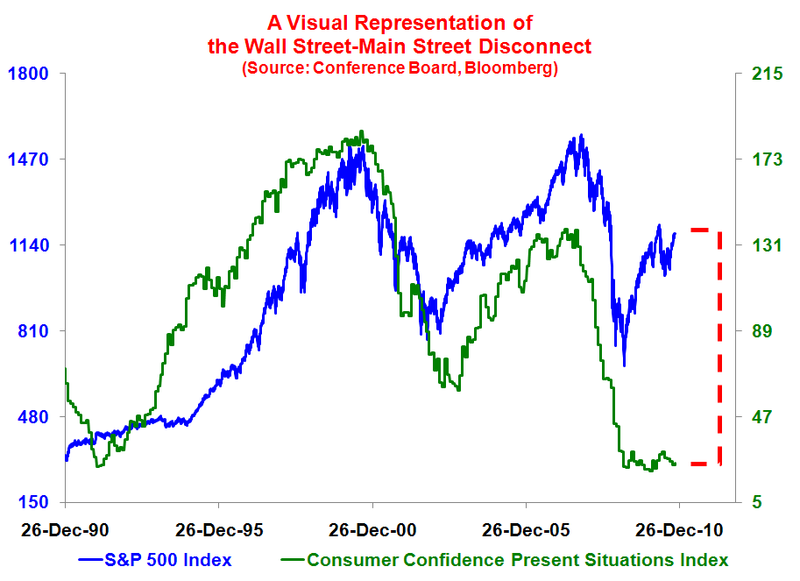 Affirm the Bernanke/Greenspan put, or take away the punch bowl? The possibility that the Fed may tighten is a 2H 2011 story. When that time comes, what does Helicopter Ben do? Does he err on the side of avoiding deflation with QE3 or does he take away the punch bowl? Stocks already appear to be overvalued. 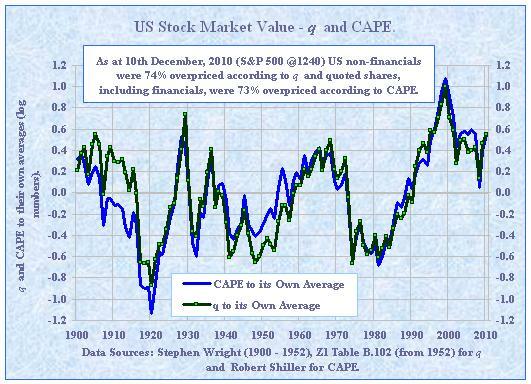 The Shiller P/E ratio is 22, which is not exactly cheap, and the Tobin Q shows US equities to be 74% overvalued. How will the markets react if the Fed takes away the punch bowl? Or does it? For now, I wouldn't worry too much and enjoy the liquidity party that the Fed is throwing. Leave the worrying for the 2H. According to the federal funds futures market, the Fed will begin raising rates sometime next year—with the federal funds rate reaching about ½ percent by December 2011. In fact, rising rates next year has been the implicit forecast of the futures market for the past year—except for the month of October during which many FOMC members were promoting quantitative easing. As 2010 has come to an end, I would like to review the record of the Inflation-Deflation Timer Model for the year. The chart below shows the cumulative returns of different asset classes, with December 31, 2009 indexed at 100. The red line represents commodity returns, as measured by the Reuters/Jeffries CRB Index, the black line equities, the S&P/TSX 60, and the blue line the US long Treasury bond. The shaded areas are the signals of the Inflation-Deflation Timer Model, as disseminated in previous Trend Watch publications. The Model's record in 2010 wasn't perfect but it wasn't bad either. For all of 2010, it correctly remained long risky assets, either in the form of equities or the higher beta commodities, and those assets had positive returns for 2010. The grey areas were “inflation” signal periods, which would have moved the model portfolio into commodities, and the white areas were “neutral” signal periods, which would have moved the model portfolio into equities. The green shaded area represented a period when the Inflation-Deflation Timer Model gave off an “inflation” signal, in which the Model would have normally bought commodities. However, I overrode that signal and stayed in “neutral” because of the anomalous condition of rising commodity prices and falling bond yields. It wasn’t until mid-November when bond yields began to rise again that we moved to an “inflation” reading. As it turned out, our model override was incorrect as the Model correctly forecast the outperformance of commodities relative to equities. In retrospect, I would still have made the decision to override the Model for risk control reasons as commodity and bond markets were giving highly divergent market signals of inflation expectations. At that point, my level of confidence in the model was relatively low. In the words of Jeremy Grantham of GMO, the "true job [of good quants] is to override the model in critical junctures, based on non-numerical factors." What is the Model saying now? Currently, it remains firmly at an "inflation" reading signaling a long position in commodities. As I have written elsewhere, I believe that the intermediate term trend remains up, which means that traders should remain long high beta risky assets. However, we should be prepared for a short-term correction, which should be a good entry point for new cash. My best wishes for a happy and prosperous 2011.